If you need a small area of rubber flooring material, this product is a great and economical solution. 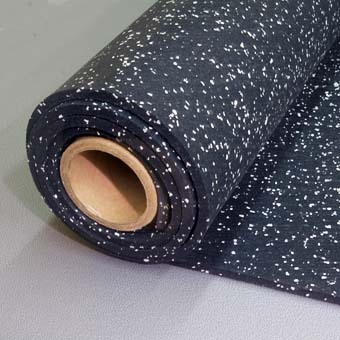 Perfect for use as home gym mats, this 4×10 foot, solid piece of 1/4 inch thick rubber is available in either 100% black or a 10 percent fleck of a variety of colors. Excellent as cushion for standing on hard floors or easily cut it into gym mats, rolled rubber can be used under exercise equipment where tough and durable rubber flooring is needed. It will reduce vibration and noise as well as protect the floor. This rolled rubber material is a high density material that will easily withstand the weight of heavy equipment and high traffic areas. Use it as a home gym mat, for aerobics, or other exercise to minimize stress on your joints. Rolled rubber has anti-fatigue properties. This product can also be used in the basement or garage to create a safe and durable flooring surface. It is waterproof and easy to install. Better still, rolled rubber is a green product. With the color choices available, this roll of rubber will enhance the appearance of any room. It will also increase safety and protect your floors from wear and tear. Installation is easy. Rolled rubber can be applied using a double sided, tape-down method or, in smaller residential locations, you can simply dry lay it. If you would like to use it as rubber mats, simply cut the piece to desired length and take it with you wherever you want to go. Rolled rubber is lightweight and easy to transport and install. Clean this roll of rubber with a damp mop and floor cleaner with a neutral ph. At Greatmats, we keep rolled rubber in stock and will ship direct to your door via UPS ground. It typically arrives within 3-6 working days from the time of order and comes with free shipping in the lower 48 states. Contact Greatmats at http://www.greatmats.com – 877-822-6622.